Buy American Made Flanders Handlebars!!! We have the Largest Selection Anywhere!!! In August of 1945 Lucile and Earl Flanders decided to turn their cherished hobby of motorcycling into a full time career. Earl had been an avid rider in California desert events and felt the key to his success was his custom made handlebars. He began by meticulously hand fabricating each handlebar, designing them for and naming them after racing greats, such as Ed Kretz, Skip Fordyce, Earl Farrand and Jack Milne. The list became so great that numbers needed to be assigned to the handlebars, thus becoming the Flanders Classic handlebar line. The legacy of quality construction and superior service has since been carried on by Earl's sons and grandchildren. Lucile and Earl Flanders on their 1938 Indian Scout. 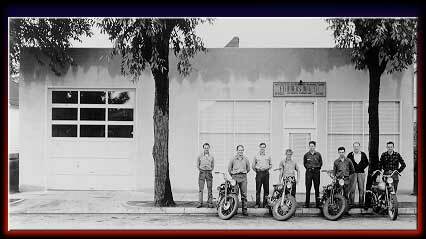 Before they even started their business, Earl had developed a good reputation for his skill in repairing and improving the performance of racing motorcycles. Throughout the war years, Earl had made a little extra income for his growing family by moonlighting: the family's garage was his shop, and he could get away with manufacturing motorcycle parts in a residential area because he could claim it to "be helping the war effort." The decision was then made to expand on what he knew and liked, and Flanders Manufacturing Company was founded. To break the 200 m.p.h. barrier was the desired, but seemingly untouchable goal of many Bonneville motorcycle riders in the early 1950's. The barrier was finally broken by Wihelm Herz on a 500cc supercharged, double overhead cam, V Twin cylinder NSU streamliner on August 4, 1956, with a top speed of 211m.p.h.. Left to right: NSU Chairman Dr. G.S. 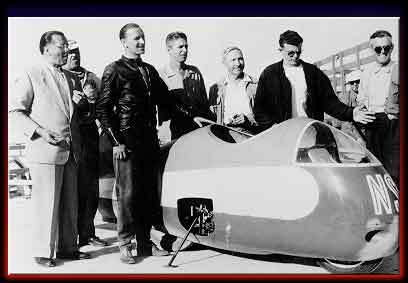 von Heydekamph, Herman Riedel (Field Representative with Flanders Co. for over 17 years), NSU record holder Wihelm Herz, Earl Flanders (the Chief Referee at Bonneville Speed Week for nearly 20 years), Freddy Ludlow (another Flanders Co. Field Representative), 15 year old John Flanders, and an un-named person. Freddy Ludlow was no stranger to speed records. In 1920 Freddy helped set a motorcycle sidecar speed record at Daytona and in 1938 he set a pair of speed records on a pair of Hap Alzina's Indians. Photo by Bill Bagnall, from the October 1956 issue of Motorcyclist magazine. 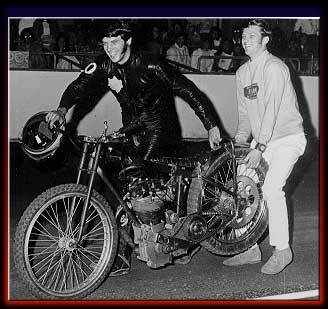 Bruce was the first of Earl's sons to follow in his footsteps and race Speedway. Bruce was riding his homebuilt bike (Velocette engine in a Flanders employee, George Williams, created frame) when the chain wrapped itself around the sprocket. Luckily for him, his brother Paul did not mind giving him a lift back to the Pits on that 1970's Costa Mesa, CA night. Bruce never lost his love for racing and you can still hear him as an track-side announcer at race tracks all over the country, you may even catch him on ESPN or Prime Sports. Photo by Dennis Greene. Earl's eldest son, John Flanders, was an avid motorcyclist even before he reached his teens. Currently John races almost every weekend when he is not busy with his duties at Flanders Company. 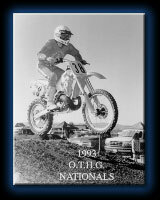 The Kevin Heath photo of John is from the 1993 Over The Hill Gang Nationals in Perris, California. Paul Flanders has riden in and helped organize many various Dual Sport rides. 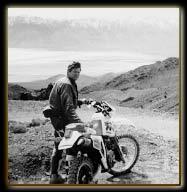 This Dave Tonkiss photo of Paul was taken during a dual sport Death Valley 400 ride. Paul did not just limit himself to just motorcycles over the years. From 1968 to 1970, Paul held an NHRA Drag racing record in the D/Stock class, with a 1966 Chevrolet.